Polythene bale bags, pallet covers and form, fill and seal (FFS) polythene films for animal bedding producers. Palagan's animal bedding film and sacks are designed to offer extra strong protection and to be easy to fill and seal. Our team of technical experts develop bespoke animal bedding films to allow outside storage and easy handling. We understand how animal bedding businesses struggle to guarantee perfectly sealed bale bags. Recognising that animal bedding processors experience slower production if their polythene film lets them down, Palagan have the solution. Our baling film enables fast production, great shaped bales and efficient palletisation – all in a puncture resistant material that reduces waste and the need for repacking. Palagan's great quality bale bags and baling film are dependent on five critical factors that work together to make effective baling film. A perfectly fitting bag is essential for efficient production. Slow output and poor bale shape are often associated with incorrectly sized bags. If the bags are too small, they will slow down fill times or may not fit the chute at all. If the bags are too large, the bales will round off or collapse. This can create a poorly shaped and potentially unsafe pallet, and can impact the number of pallets that can be loaded on your HGVs. Designing bale bags with optimal dimensions is critical. Palagan are experts in bale bag sizing. Contact us to help solve this problem. Contact us to help you solve this problem. Some animal bedding products are surprisingly sharp which can result in unwanted holes in the packaging. Whether you are filling timber shavings, chopped straw or miscanthus, unpredictable punctures reduce bale integrity and risk water ingress during storage. 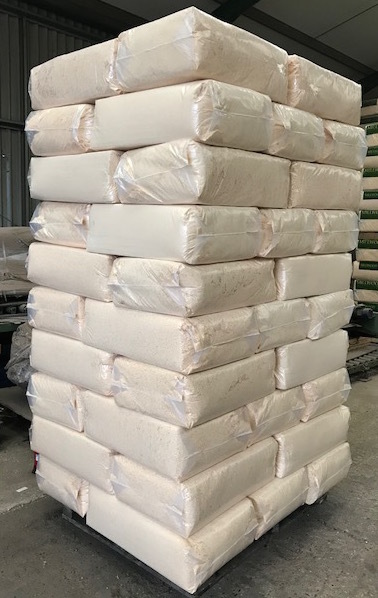 During processing and at your customers' premises, manual handling of the bales several times can result in the film being punctured by fingers. Choosing a high strength film is critical for faster, cost effective processing and superior final presentation. Many older baling machines can struggle to achieve consistent seal integrity, particularly on the leading or trailing seals. This can be due to extraction issues allowing dust particles to be trapped between the polythene when sealed. This is made worse by ageing machinery losing seal head alignment, less control on seal temperature and dwell time. The result is ineffective or burst seals. Palagan make high sealability films that are forgiving on older machinery. This reduces the high costs of engineering resources needed to effectively seal standard films. The surface feel of your packaging is critical to enable the bags to slide onto the chute or pass over the machine former. The film must also open easily to enable fast production rates. Conversely the film must be sufficiently low slip to enable your bales to stack securely during palletisation and transit. Palagan films feature low slip outer surfaces with a higher slip inner surface to address both of these needs. Applying a logo, product information, handling instructions or other details helps products stand out on the shelf and promotes you or your customer's brand. Using Palagan's design and printing service, we help create the right design to suit your requirements and create a great looking finished bale. Whether you prefer coloured bags, different levels of film opacity or multiface print, we offer an end-to-end design service which accounts for variations in your fill process. We understand that every baling machine is different. At Palagan, our single wound baling films and bale bags are designed and manufactured to work with all varieties of baling machinery. Palagan work closely with many of the leading baling machinery manufacturers to develop films perfect for each machine, any bale contents and all environments. Get in touch to receive a quote within hours.